We have reported this case as the incidence of open globe injuries following dog bites is only 1%–2%. Animal bites are usually very deep due to the force of the bite. This force also causes inoculation of pathogenic microbes from the saliva into the wound. Hence, there are higher chances of infection. Infection is further aggravated by crushed necrotic tissue as a result of this bite force. 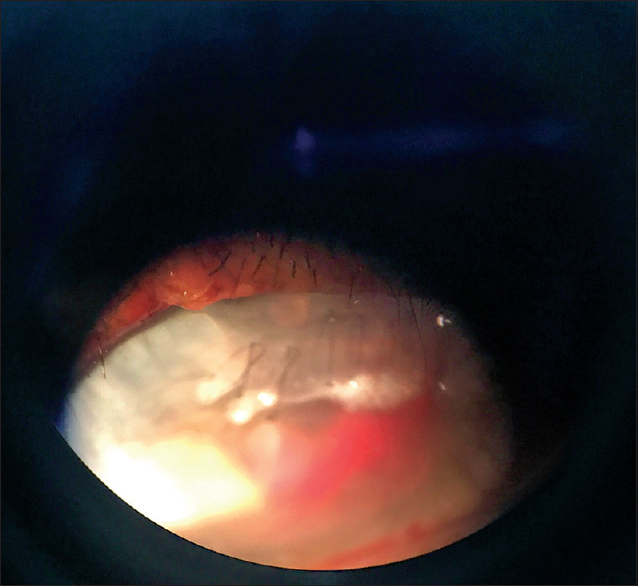 Ocular bites are not very common, though when they occur, they are associated with severe ocular adnexal injury, especially to the lids and canalicular system. Dog bite injuries over the head, face, and neck are classified as Class III injuries and have the highest risk of transmission of rabies. Important points in preventing infection are a thorough cleansing of the wound, preventing further tissue damage, primary closure if the wound is low-risk for developing an infection, rabies postexposure prophylaxis and rabies immunoglobulin at the site. 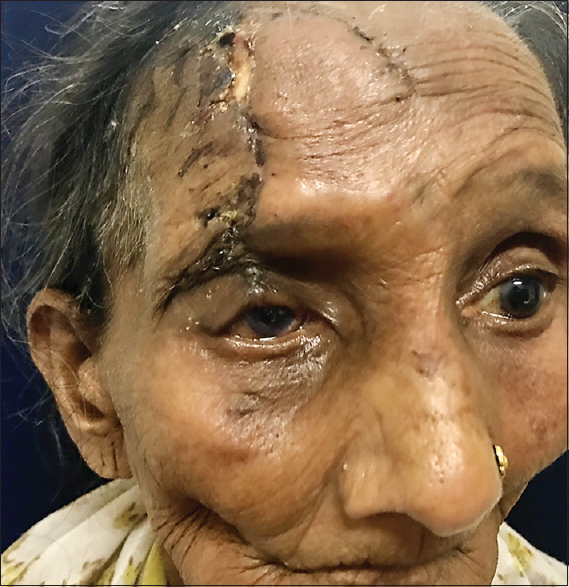 A 75-year-old woman presented to casualty with history of injury to the face and right eye secondary to a stray dog bite. There was a history of sudden painful decreased vision in the right eye with a gush of warm fluid from her eye. The patient gave history of good vision before this incident and history of both eyes being operated for cataract 7 years ago with intraocular lens implantation and good postoperative vision. The patient had no systemic comorbidities. On examination, her vitals were stable. There was a full-thickness eyelid laceration measuring 6 cm × 1 cm × 0.5 cm with an avulsion of the skin of forehead extending until the cranial vault. Tissue loss was noted. The anterior segment of the left eye was within normal limits with an intraocular lens in situ and visual acuity of 6/9 by Snellen's chart. The patient's visual acuity in the right eye had reduced to the perception of light, with inconsistent light ray projection. There were right eyelid edema and periorbital ecchymosis. On slit lamp examination, there was a corneoscleral tear approximately 5 mm × 3 mm × 0.5 mm with surrounding cornea edema. There were circumcorneal and ciliary congestion. The anterior chamber was shallow with Grade 1 hyphema. Details of the iris, pupil, and lens were not clearly visible. The globe was digitally soft, consistent with the findings of an open globe injury. After asking the patient to close her eyes, the face and scalp wounds were washed thoroughly with soap and water for 5 min. The eyelid lacerated wound was washed gently but thoroughly with normal saline. The patient received active and passive management for rabies as well as tetanus toxoid, analgesics, and antibiotics. As the avulsion was so large, stay sutures were placed in the ward and patient was shifted to OT for suturing of the open globe injury. The patient was given peribulbar anesthesia. The eyelids were cleaned with povidone-iodine gently to prevent further extrusion of ocular contents. The patient was draped and wire speculum positioned. The corneoscleral wound was sutured first with 10-0 nylon interrupted sutures. An anterior chamber lavage was done and reformed. Subconjunctival injection of dexamethasone and gentamycin was given prophylactically. The stay sutures were removed, and the eyelid wound was irrigated again with normal saline. The eyelid was sutured in layers with 6-0 vicryl and 4-0 silk sutures. The patient was started on intravenous antibiotics (cefotaxime 1.2 g 12 hourly and metronidazole 500 mg 8 hourly) topical antibiotic-steroid eye drops (gatifloxacin 0.3% w/v + prednisolone 1% w/v), cycloplegic eye drops (atropine sulfate 1% w/v) thrice a day and an antibiotic steroid eye ointment (chloramphenicol 10 mg + dexamethasone 1 mg + polymyxin B 10000 IU) at night. The patient was discharged and told to follow-up after 1 week and advised to follow her anti-rabies vaccine schedule (0, 1, 3, 7, 14, 21, and 30) [Figure 3]. The patient was not very compliant and thereafter followed up after 1 month. On examination, the corneoscleral tear was well apposed with interrupted sutures. The surrounding cornea appeared decompensated [Figure 1]. The anterior chamber had an irregular depth with a blood clot in situ [Figure 2]. Iris was normal; her pupil was irregular and not reacting to light. Posterior chamber intra-ocular lens noted in situ. Intra-ocular pressure was on the lower side but digitally formed. The postoperative B-scan showed a retinal detachment. The eye is now blind. The patient was further referred to plastic surgery for forehead flap reconstruction due to tissue loss [Figure 4]. Even in the presence of severe periocular lacerations caused by dog bites, the eye is usually undamaged. In general, the dog's blunt tooth pushes the globe out of the way. Injuries sustained in the area of ocular adnexa and lids probably protect the globe itself from injury. Furthermore, due to the blink reflex, the lids, adnexa, and lacrimal apparatus bear the brunt of dog bite injury protecting the globe. The incidence of open globe injuries following dog bites is very rare with only a 1%–2% incidence. 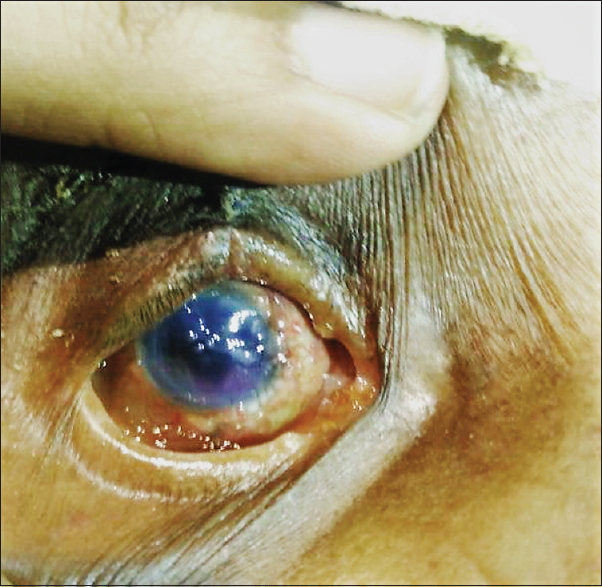 Although visual outcome in cases of open globe injuries is very variable and depends on factors such as size and site of injury, the presence of an afferent pupillary defect, visual acuity at presentation, concomitant hyphema, lens extrusion, and retinal detachment, all measures must be taken to prevent rabies in such a case. Timely detection, early management, and patient cooperation for follow-up can lead to a better postoperative visual outcome. 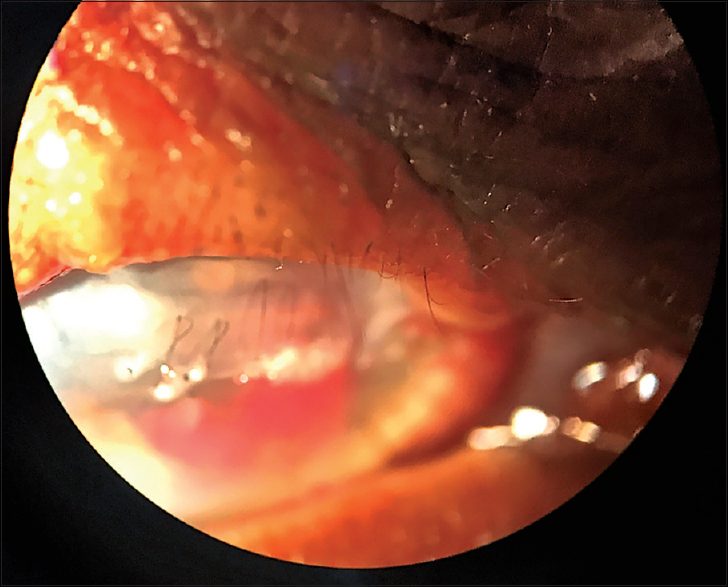 Although the visual recovery, in this case, was poor due to underlying retinal detachment, major complications such as post open globe endophthalmitis, central nervous system infection and septicemia were averted. Timely referral to tertiary centers with facility for primary repair is key. The patient should receive both active and passive immunization in such a case. Singh B. Analysis of ocular injury cases caused by dog bite and their prevention. IOSR J Dent Med Sci 2016;15: Pp 16-18. Prendes MA. Ocular trauma from dog bites: Characterisation, associations, and treatment patterns at a regional level I trauma center over 11 years. Ophthalmic Plast Reconstr Surg 2016;32:279-83.